It really pays to listen to your friends. (Not all of them though, because if they’re encouraging you to do things that aren’t good for you, maybe you should consider getting new friends.) Well where did that piece of parenting advice come from? Anyway, I happen to have good friends, so I feel that it is okay to listen to them. It just so happens that I had two friends in one week tell me that I was missing out by not adding sweet potatoes to my menus more often. When the first friend said it, I kind of nodded and smiled. But when a second friend mentioned it a few days later, I sort of wondered if God was trying to tell me something. Okay, I’m pretty sure He is working in bigger ways in my life than sweet potato consumption encouragement. But still. I figured there might be something to this sweet potato thing since it came up twice in one week with two different people at two separate times. (Am I making too much of this? I mean, should I just get around to sharing the recipe already?) Why have I not been eating or feeding my family sweet potatoes very often, as in, pretty much never? So it turns out that while I think my friends may have helped me become an addict in this regard, it does pay to give in to sweet potato peer pressure. Scrub and cut sweet potatoes into wedges or fries – as thin as you like. Toss them in olive oil or coconut oil (about 1 Tablespoon per sweet potato). Place them in a single layer on a baking pan. Sprinkle on sea salt and bake in a 400° oven for 30-40 minutes. or Deep fry the cut sweet potatoes in a fryer (we have this one, which works great) filled with Refined Coconut Oil or Palm Shortening for 3-4 minutes, remove, salt, and eat. What is your relationship with sweet potatoes? How do you like them cooked? And while it’s completely irrelevant, I am curious. Do you like marshmallows? Suggestions for you all that are calorie/weight conscious. 1. Spray the potato strips with a cooking spray (Pam) instead of rolling them in olive oil. 2. Sweet potatoes are 114 calories per cup and white potatoes are 104 calories per cup. You can make fries using butternut squash (similar taste to sweet potatoes) and turnip using this same method for much fewer calories. Butternut squash is 63 calories per cup and turnip is 36 calories per cup. I forgot one more…chili topped sweet potato! Very yummy! Plus they are FILLING…perfect for al those boys you have to feed! Oh, I agree! Why, oh why, did I ever think french fries (white potatoes) were good? Sweet potato fries are to die for! I agree with you about the sweet potato casserole with marshmallows on it: Yuck! But I love baked sweet potatoes, with (lots of) butter, sugar and cinnamon. Mmmm. I love sweet potato fries, chips, and hash browns. Yum! I totally agree about the sweet potato casserole! But I love baked sweet potatoes with butter, salt and pepper. Perfect! I have also made a sweet potato salad by roasting slices of sweet potatoes and mixing them with feta, cilantro, and a dressing made with lime juice, olive oil, and cumin. Yum! I love sweet potato casserole with gooey marshmallows on top! But only on Thanksgiving. Any other time it just doesn’t sound very good. My kiddos would eat marshmallow by the bag full if I let them but the only other thing I use than for is Christmas fudge. I love, love, love sweet potato fries and eat them several times a week now! Love sweet potatoes. They are yummy even just baked with some butter. But no, marshmallows are not good and should never be put on sweet potato casserole. My friend makes sweet potato casserole every thanksgiving and there are no marshmallows, rather a yummy crunchy pecan topping, it is so good, it’s may be the best thing we have at the meal. Sweet potatoes with butter and cinnamon (and maybe sometimes sucanat)is one of my favorite side dishes ever! When my son was a baby sweet potatoes mashed up was his absolute favorite food! We even have a picture of him with his face covered in it. Sweet potatoes fries are pretty great too. Marshmallows I only eat if they are at the end of a stick being roasted like maybe twice a year? I think my favorite way to eat sweet potatoes is baked, with some butter, salt and pumpkin pie spice sprinkled on top! Another family favorite way to eat sweet potatoes is to do them like this recipe, but add rosemary and garlic … and I can’t remember if there were any other spices! I cut my sweet potatoes and rub them in a coconut oil mixture with a bit of sea salt and cinnamOn and a little pinch of chili powder. Then I bake them in the oven — delicious! Oh I LOVE sweet potatoes and coconut oil! Such a good combo! I haven’t ever tried witht he pinch of tried the chili powder though. Sounds like something I will have to try! I love sweet potatoes- sprinkle them with cinnamon before baking and they are amazing! There is a restaurant in Omaha you should try next time you are there called Blue Planet…their sweet potato fries are amazing! . I love sweet potato fries and baked sweet potatoes, but no marshmallows. Yuck. I have a question that has been bothering me for some time, and maybe you can answer. When you coat veggies in olive oil and then roast in a hot oven (like the above recipe states 400 degrees), I am wondering if it is safe to cook food this way since the temp. ends up being way above the smoke point of the olive oil (especially if it is unrefined, EVOO, which is the only kind I use). I have heard that in baked goods, it is okay to include the olive oil as an ingredient and bake at a temp. higher than it could normally handle because it is somewhat protected(the internal temp. of the baked product does not actually reach the oven temp). I’m just not sure about using it alone at this temp. Have you heard anything about this? I am afraid of the healthy properties of the EVOO becoming altered if heated beyond what is a safe temp. for this oil. Thanks! Oh yeah, I’m also wondering what kind of oil you use in your fryer. The EVOO is fine to coat things and then roast them. I do it all the time. Never had a problem before. As for frying I use Palm Oil. I know you weren’t asking me but I thought just in case Laura doesn’t get a chance to answer you someone should. Joy, you are correct…..EVOO should never be used in cooking with high temps. I only use EVOO for making salad dressings. I use coconut oil to make my baked sweet potato fries. Amy, so what temp. do you bake your fries with coconut oil? Would 400 or even 450 be okay for this oil? Thanks! Coconut oil is fine for all high temps. I bake my sweet potato fries at 425 for 20 minutes. This sounds weird, but you’ll never do plain sweet potato fries again! My recipe uses paprika and cinnamon, plus salt and pepper. You could probably google those ingredients and find the right recipe. I’m nursing a baby right now, or I’d jump up to look at it! I think it’s 1 to 1 1/2 lb sweet potatoes, 1/4 c oil, 1 tsp paprika (? ), 1/2 tsp cinnamon (? ), salt and pepper. Delicious!! I was going to comment with a similar recipe for sweet potato fries. I love them with paprika and a bit of cinnamon. SOOOO GOOOOOD. We love sweet potatoes around here. It took me a long time to try them again as an adult. As a child, I only saw them candied at thanksgiving. Yuck! Now, I’m take it or leave it for marshmallows. Unless they are homemade…then watch out. The Alton Brown marshmallow recipe online is phenomenal. They are soft, very vanilla-y, and not as sweet as the store bought. Delicious. I didn’t think I like sweet potatoes either, until someone suggested I try them baked with sour cream on top, like a regular potato. I thought it sounded gross, but it’s sooo good! It’s my favorite way to eat sweet potatoes, though fries are tasty too. Fires. It’s just Sweet Potatoes cut into wedges and then sprinkle a little brown sugar and pepper on them and bake 350 for about 20 minutes. They are FANTASTIC, EASY, and QUICK! whonu sweet potatoes, brown sugar and pepper could taste so good!!!! I could have written this post! The ones my relatives would make at Thanskgiving made me want to throw up because they were SO sweet (and I have a sweet tooth). Gross! Finally a few years ago a friend made a sweet potatoe casserole for our annual 4th of July party and I tried it. It was delicious! My husband and boys loved it too. I started making it but its loaded with butter (seriously loaded) so I looked for something healthier. Now I peel them, boil them with some salt, drain and cool for a few minutes. Then I purée them with some butter (about 1 Tbsp per big potatoe) vanilla extract, a little brown sugar and cinnamon. They are wonderful!! My mom never made them growing up and now I wonder why! We are big sweet-potato fry fans around here. I make these more often than white-potato fries. In the summer time we make sweet potatoes on the grill using a veggie pan. Saves us from heating up thge kitchen! Reading all these posts made me laugh! I HATE that gooey sweet potato/marshmallow stuff! To top it off, my mom made it with canned yams. Canned any kind of potatoes is just wrong, in my opinion. My husband, however, grew up loving sweet potatoes, and he has converted me (as long as I don’t have to eat the marshmallowy ones at Thanksgiving). He introduced me to mashed sweet potatoes with brown butter gravy, and I was hooked. Now I get excited when I find new recipes for sweet potatoes. And fries? YES!!!!! We use olive oil, coconut oil, or a combination of both, seasoned salt, and bake them in the oven. Just brown some butter in a pan on the stove. Watch it, because once it starts browning it can burn pretty quickly. Once it is a browned whisk in flour–about equal to the amount of butter you used. Add milk and stir, using a whisk, until thickened and bubbly. Add salt to suit your taste. I don’t measure, but I’m going to guess about 1/4 cup butter, 1/4 flour, and 2 cups of milk. I love sweet potatoes, but like you, never really ate them growing up. I hate the marshmallow kind, though my sister always makes them and always makes me try. “What’s not to like about them!? !” is what she always says. We like to eat them in vegetable pancakes. Shred up a bunch of veggies (carrots, onion, squash or zucchini, white potatoes, sweet potatoes, etc). Mix in an egg or two and some flour, salt, and seasonings (we like pepper and garlic). Put spoonfuls into a hot pan with a little olive oil in the bottom and spread out flat. When they’re crispy on one side, flip them over! Serve with sour cream or applesauce. Yum! I am one who’s always like sweet potatoes too. However, about 7 years ago traveling in Florida we ate at this outdoor dive (the kind that always attracts my husband!) He always says they have the best food…anyway, they served sweet potatoes fries with our burgers and it was the first time I had tried them that way. What sold me was they sprinkled a cinnamon/sugar mixture on them and apple butter on the side to dip them in. May sound weird to some but it was incredible. Now, when we have them at home if I don’t have apple butter handy, we’ll use our homemade applesauce. Try it and see if you like it! Sweet potatoes must be baked or fried at our house. No boiling or canned (ewww). My husband has a terrible memory of being forced to eat his aunt’s “famous” sweet potato casserole at Thanksgiving…and then losing his lunch all over the floor. Needless to say, he didn’t eat them for a long time. Now his favorite is baked and then mashed with butter, salt, and chopped canned chipotles in adobo sauce. Sooo easy and delicious. The issue with heating olive oil is that begins to oxidize and degrade with heat, producing free radicals. 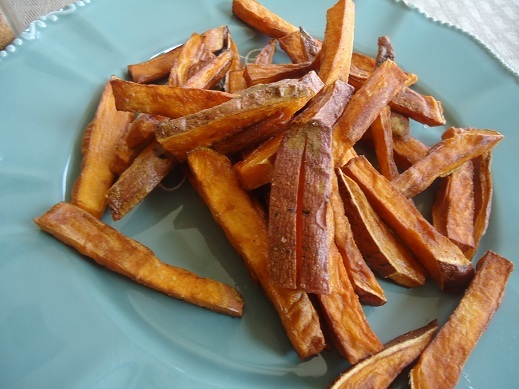 So, yes, coconut oil is your best choice…plus, it makes for amazing sweet potato fries! Thanks for this info, Nancy. The thing I was thinking is that if the oil was getting too hot (and did create free radicals as you say), how would I know? There have been times that I accidentally got a frying pan with oil too hot and I have seen it smoking, so then I KNOW the oil is no longer good to use. I just don’t know if I would see this on my roasted veggies. So … I guess it is better to play it safe and not use olive oil for this purpose. I’ll give coconut oil a try next time! I have recently discovered sweet potatoes. My favorite go-to breakfast for mornings when I just want something different is half of a baked sweet potato (peeled and cubed) with a fried egg and salsa on top. It may sound weird, but it is so yummy! Even my six year old requests it and he is picky, picky! We buy them by the case. Bought a few boxes this year for $10 for a 40-lb box and they store well. We eat them cooked or even cold the next day! I second all the suggestions for spices on the fries, cumin and cayenne are our faves. And I consider marshmellows to be one of “nature’s” perfect foods. I am gluten free and rarely make GF sweets just for me. O bake regular for the rest of the family, its cheaper, and have a bag of marshmellows in the pantry for me when I need a sweet snack. I love sweet potato souffle as we call it. My mother always put crushed pineapple and coconut in hers. Then a topping of brown sugar, flour, marg. YUCK, and pecans. It was delicious. So, I make mine using sucanat, uns. coconut, butter, uns. pineapple, etc. It s very good too and much healthier. However, I do LOVE marshmallows all by their self. I wish I didn’t. 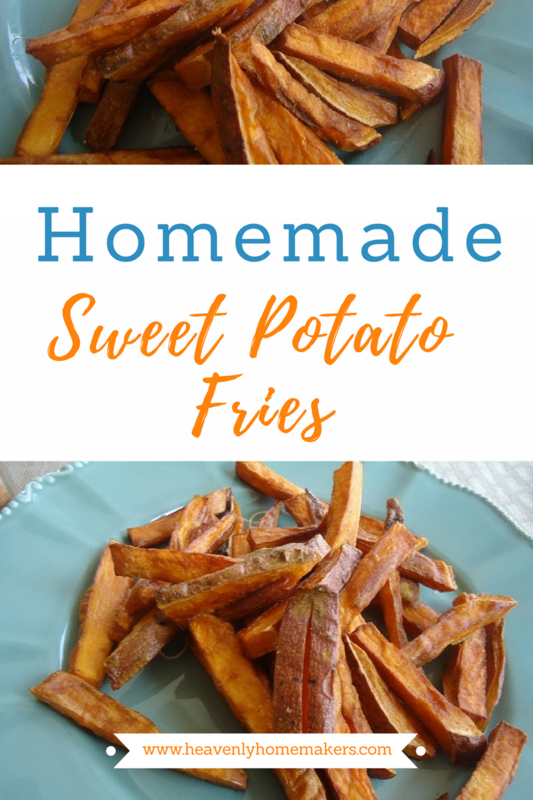 I love sweet potato fries and so do my kids! I’ve been making them for years by tossing the wedges in coconut oil and cinnamon and then baking until they start to brown. Delish and no added sugar is needed! Love sweet potato fries!!! I went from eating candied sweet potatoes as a kid (more ‘candy’ w/ that sweet potato, please!) to only eating them savory. That’s not entirely true. the fries are savory. I also bake them, add a touch of butter, a sprinkle of salt and some cinnamon! yum-o!! And I love them topped w/ taco meat also. Wow, I thought we were just having a big salad for supper…. well, yes, salad tonight and a taco topped baked sweet potato tomorrow! Oh, and I agree with your sentiments regarding the casserole – gag me. I have always hated that yucky sweet casserole at Thanksgiving, and I have a serious sweet tooth. I love the fries with sea salt then dipped in home made Ranch! SO yummy! I don’t eat marshmallows, but I do have a wonderful sweet potato souffle recipe that is a staple at our Christmas dinner. My husband doesn’t like sweet potatoes, so I’m not sure I could sell him on the fries. I used to HATE sweet potatoes because of the Thanksgiving casserole thingy, but I loooove some sweet potato fries – either salted or with (homemade)”Emiril’s Essence”. And most recently, I love half a baked sweet potato, warm, with coconut milk and cinnamon in a bowl. Heaven. Going to try the apple butter one – thanks! I make sweet potato chips! I have a very picky 2-year old who doesn’t eat vegetables (we’re in the process of adopting her…she came as a non-veggie eater :), unlike my 3-year old who LOVES his veggies). BUT, she likes anything crispy, so I can get her to eat different colored veggies by making them into chips – kale chips and sweet potato chips are the favorites! I bake them just like the fries recipe, but slice them really thin and bake them until they’re crispy. Yum! All ten of us love sweet potatoes. Baked, fried, mashed with a hint of butter, etc. We NEVER pervert them with marshmallows. We prefer our mallows over the camp fire! Glad you are trying something new!! We love sweet potato fries too! If you are interested in adding a bit of fluffiness to your fries, you can try soaking them in hot water for 10-15 minutes just before frying/baking. The starch absorbs some of the water, making yummy fluffy insides! I love that you said “That Time of Day”. I totally hear you on that and on the not wielding a sharp knife. Great tip! Glad you tried this!! We love sweet potatoes cooked like this. I just put them in the pan and brush on butter and put them in the oven. Often they just get cut into chunks to be quicker. I also like that they cook so quickly. Glad that your family liked them! I am finding it really hard to believe you like butter as much as you do and have never–can it be?–never eaten baked sweet potatoes with butter oozing all over and salted to taste?? I have always loved sweet potatoes in whatever form, but have never gotten into the habit to make that too sweet casserole you mentioned. But I loved them baked and with the butter…mmm!!! I would love to try the fried ones, too, although I make my own butter since we have a few cows of our own and I cannot get coconut oil in the country where we live. Our family likes them grilled with onions. I peel and slice up sweet potatoes, thin slices of onion and toss them in olive oil with thyme, salt and pepper, then make a foil packet of them (adding an ice cube) and throw them on the grill while we grill steak. I flip the packet over one or two times. Or this veggie tian is awesome:http://budgetbytes.blogspot.com/2011/08/summer-vegetable-tian-660-recipe-110.html–but I add sweet potatoes–basically zucchini, tomato, potato, summer squash, onion, garlic, olive oil, shredded cheese. 30 min. covered, 10 – 15 uncovered with cheese. 350. Perfect summer veggies! Yes! Sweet potatoes are great with onions! However Finding Joy in My Kitchen has a WONDERFUL sweet potato casserole! We grill ours!! Slice into chips, toss with oil and brown sugar. You can add cinnamon too. Ends up carmelized and so tastey! I like them well done. I like marshmallows toasted over an open fire, but not on top of sweet potatoes. My favorite way to eat sweet potatoes is to steam them, cut them open, apply butter and salt and scoop directly from the skin into my mouth, yum! My family really likes sweet potato hashbrowns. Since sweet potatoes are dryer than regular potatoes, there is much less to do to prep them for frying. Then, I put a 1/4 inch of coconut oil in my electric skillet, plop mounds of shredded sweet potatoes (skins too!) into the pan and flatten them slightly. Then you MUST leave them alone until they are brown on the bottom or they will fall apart when you try to flip them. Fry on both sides, drain on paper towels and salt them. Eat hot or cold. My kids beg for these every year when sweet potato harvest comes to our area.